Rahula, 'the seizer', is one of the three main protective deities of the Nyingma or 'ancient tradition' of Tibetan Buddhism. As the 'great god of the skies' Rahula is the deified form of Rahu, the dark 'shadow planet' that causes eclipses of the sun and moon to occur. Rahu's malefic form is also believed to be able to cause epileptic fits when his shadow happens to fall upon a person. 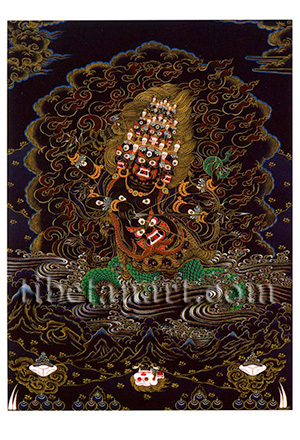 Rahula is dark reddish-brown in colour and extremely wrathful, with nine heads and four arms. His nine heads are arranged in three ascending tiers of three faces, each with three bulging eyes and a widely gaping mouth that reveals a twisting tongue and four sharp canine teeth. Each of these nine heads is adorned with a crown of five dry white skulls, a poisonous mist emanates from their mouths, and the tawny-yellow mass of his matted hair-locks blazes upward like fire. Crowning his nine heads is the black raven's head of the eclipse planet Rahu, which has three piercing eyes, a sharp beak made of meteorite iron, and a tongue that is like a blazing sword. The lower half of Rahula's body appears in the form of a gigantic serpent that writhes and coils amidst an ocean of blood, and the upper half of his powerful body is adorned with a thousand eyes that gaze out over the three realms. In the centre of his abdomen is Rahu's huge gaping mouth, with which he swallows all of his enemies. He is adorned with bone and jewel ornaments, a flayed human-skin shawl, a tiger-skin loincloth, a garland of fifty severed heads, and a long serpent that serves as his sacred-thread. With his two principal hands he holds a drawn bow and arrow, which he aims at the heart of an enemy. With his second right hand he wields aloft a victorious 'crocodile banner' (makara-dhvaja), and with his second left hand he holds a long serpent noose. He stands amidst a blazing mass of fire within a landscape of sharply pointed vajra-rocks, with jewels, tusks and skull offerings appearing in front of him.